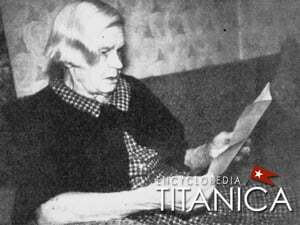 SURVIVOR OF THE TITANIC Mrs. Anna Marie Salmi, Issaquah, holds her oldest and one of her most prized possessions, a night school English class certificate she received in Boston in 1913. She lost all her earlier accumulated belongings except a nightgown in the sinking of the liner Titanic when it hit an iceberg in April 1912. The view from the deck of the steamer Mrs. Anna Marie Salmi boarded that April Wednesday in Southampton, England, was a wonderful one - like looking from a third-story window over a busy harbor. But the view from the deck about 1 o'clock the following Sunday night shocked her. The ocean surface was so close "you could step in it", she said. She realized then that the great "unsinkable" liner, on its maiden voyage, was going to the bottom of the sea. For Mrs. Salmi, of North Tenth Street, Issaquah, is one of the handful of people now living who survived the Titanic disaster of May 15, 1912 [sic], the greatest marine tragedy in history. NEW YORK-bound through the clear, calm night at more than 20 knots, the 66,000-ton [sic] queen of the Atlantic passenger run grazed an iceberg, slitting open five of her 16 waterproof compartments and sank at 2:20 a.m., two hours and 40 minutes after the collision. Because she had lifeboats for only 1178 of her 2207 people, boat launchings were disorganized and radio distress calls were heard too late, about 1500 people died in the sinking. Mrs. Salmi was born Anna Maria Sinkkonen, December 3, 1882, in Poutalasta, Finland. When 14 she lost her mother. She grew up without a single day of formal schooling, knowing only hard work. She did learn to read and write her own language, however, and from friends and relatives who had gone to the United States she learned of and began to dream of going to this country where, perhaps, there might be a better life than she could see ahead of her. Her community got its first public school the year that she left. It must have taken great courage and resolution to uproot this pleasant woman of 30 and take her thousands of miles away to a land where the language would be strange and life different. THE TRIP in a small vessel down the gulf of Finland and across the North Sea was a rough one and she was seasick. But once ashore in England she felt better and when she boarded the Titanic on April 10 at Southampton she was already looking forward to meeting friends and relatives in the new world now only a week away. Looking now at pictures of the ship, she can only shake her head at the beauty and luxury of the panelled lounges, diningroom, salon and passenger quarters and at memories of the lovely linen, crystal and silver at the table where even the wants of a Finnish immigrant woman were a matter of concern to the attentive steward. Mrs. Salmi, who apparently had a little money, traveled second class rather than in steerage where hundreds of poorer immigrants were cooped up. She recalls confusedly that after she had been assigned a cabin the captain asked for it for some other passenger and that she received $40 back when she was given a different place. Neither the $40, the cabin or the ship's master survived the voyage. MRS. SALMI had an upper berth in a cabin shared with a 16-year-old Finnish girl, Lyyli Selvern [Silven], who was crossing with her uncle and aunt. The girl had gone to to a shipboard dance that Sunday evening and when she came in Mrs. Salmi was already in bed. Both were asleep when, at 11:40 p.m. there came a sort of grinding bump, not rough, but enough to wake them up. With 40 seconds warning from a lookout that an iceberg loomed ahead, the ship had changed course enough to scrape past it. Mrs. Salmi wondered dreamily what had happened, then went back to sleep. The girl got up and went to see her uncle and aunt. How long she napped Mrs. Salmi doesn't know, but by and by she was awakened by a steward's pounding on the door and shouting something in English. Soon Lyyli returned with word of what had happened and then another steward came and forced them out of the cabin. They must leave the ship. This was madness, Mrs. Salmi thought. Everybody knew that such a great ship could never sink. But when she got on deck, clad only in her nightgown and a stateroom blanket, the disorder, the running back and forth of people in lifejackets, the sight of rockets being fired in flaming arcs across the night sky, the cockle-shell boats being crammed with people, the unnatural slant of the deck toward the front of the ship and more than all else, the awful nearness of the ocean, brought her to a realization of the truth. Her recollections are more confused from this point on. She recalls that the ship's band continued to play from one of the upper decks. And she says she saw something which this interviewer has not seen mentioned in any published account of the sinking. SHE INSISTS that she saw "rich people" sitting in deck chairs, suicides by gunshot. How many? Two of three? Mrs. Salmi doesn't recall. "Lots of them" she says, with a wave of her hand. She also learned that Lyyli had been put into a lifeboat but that her aunt, offered a seat, had refused to leave her husband and had stayed on the ship. Mrs. Salmi apparently had no choice. Crew members grabbed her and threw her into the lifeboat where she was forced down under a seat by oarsmen. In the boarding the top of her head was injured and she lay there bleeding and half-stunned. Apparently her panicky attempts to rise interfered with the rowing and she was knocked down until she remained quiet. She lay there, cold and sick, for nine hours. BECAUSE of her position she was spared the sight of the death of the liner, the moment at which the bow-heavy vessel stood on end and with scores of passengers still clinging to rails, capstans and lines, slid vertically into the depts. She was spared, too, the sound of the screams of hundreds of life-jacketed swimmers before the 28-degree water numbed their cries and struggles. The rest of the night is a blur of bitter cold, darkness and misery for Mrs. Salmi. She glimpsed floating ice - small pieces - at one time or another, in the sea which lapped perilously close to the gunwales on the heavily loaded lifeboat. Did people complain or bicker in the boat? Were any children crying in discomfort or any women weeping for their lost husbands? Mrs. Salmi does not remember. She recalls only, as dawn came over and empty sea, the gentle stir that went through the numbed castaways as the Carpathia arrived after a three-hour race through the ice-flecked sea. She had heard one of the last radio distress calls from the doomed liner. THE RESCUE ship took from 4:10 to about 8:30 a.m. to pick up all the boats. Mrs. Salmi doesn't know just when hers was picked up. It was daylight, however, and the Carpathia was already crowded with survivors when her boat reached it. She was given hot black coffee and whisky and was put to bed in the dining room, miserably ill from the night's chilling and her head injuries. Ill and destitute when she got to New York, she recalls with gratitiude the gentleness and understanding with which she was treated by immigration officials. For years she treasured a newspaper in which there was a picture of her and other survivors whom the Red Cross had given clothing. She says she was not interviewed or called to testify at any of the hearings held on the disaster. Mrs. Salmi's head still hurt. Under her white hair scars remain today from injuries which look as though she had fallen head-first onto a graveled road. SOMEONE bought her a ticket to Boston and she boarded the train wearing a large tag bearing her name and destination. At Boston she was taken into the home of a sister until she felt better and could work. She became the maid in the home of a kind Boston police officer and while there attended high school and learned English. A certificate of her attendance at this school, dated April 4, 1913, is one of her prized possessions. She is even prouder of a later certificate saying she had completed her studies of U.S. history and civics in order to become a citizen. Lyyli survived the sinking and the two met again more than a year later when Mrs. Salmi went to San Francisco. Mrs. Salmi came to Seattle in 1917 (part way, of all things by boat to Astoria). Here she met and married a Finnish miner in 1918. They moved to Issaquah in 1922. They lived first in a company house on Mine Hill, then moved to the home where she now lives. Mr. Salmi died two years ago. They have no children. A niece, Mrs. Ida Jackson of Hempstead N. Y., has been staying with her during her recent illness. Mrs. Salmi has never liked boats or water since that April night 51 years ago.